Very good for young and old Southern gospel music fans. Easy music to read. 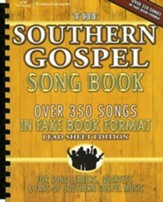 The Southern Gospel Song book. A great collection of some of the best Southern Gospel songs that we have. Love singing them and sharing them with others. I was skeptical when ordering this book if it would be one that I liked. It turned out to be very appreciated. Don't be scared away by the claims of its fakebook simpleness. It gives you the music basics that you need for you to build the other notes/chords from there.